Offering you a complete choice of products which include ffs intermittent plc operated machine, powder filling machines and coffee packing machine. UNITEK is leading manufacturer and exporter of FFS Intermittent PLC Operated Machine. Capitalizing on sound infrastructural resources, we are involved in offering hi-tech Powder Filling Machines. Our machines are highly acknowledged for their hassle free performance and robust construction. 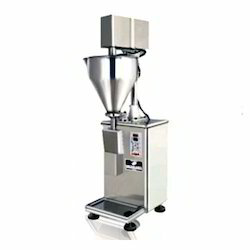 Available in different models, these Automatic Powder Filling Machines find application in food, pharmaceutical, chemical, cosmetic and more industries. Our large production capacity and vast logistics channel enable us to deliver voluminous quantities of products to our clients within the promised time schedule. From our extensive variety of items, we offer ideal quality Coffee Packing Machine. The offered machine is produced utilizing phenomenal quality parts and ultra-current innovation in adherence with industry standards. What's more, we offer this machine in various sizes and determinations in order to cook the necessities of our customers.